The University of North Carolina at Chapel Hill is nationally recognized for its beautiful historic campus. As a native son of North Carolina, an alumnus and professor, I have had the privilege of enjoying its atmosphere for many years. I am not alone; alumni maintain a deep emotional attachment to this place for good reason. This report documents UNC’s best loved landscapes and lays out plans for their future preservation and enhancement so that the people who follow us can enjoy and create their own memories of this special place. As Carolina nears completion of the most ambitious building program in its 213-year history, we are proud that we made a determined effort to protect and preserve these historic landscapes. We thank the Getty Foundation Trustees for their generous support through the Campus Heritage program in making this campus vision a reality. It is my hope that with a greater understanding of Carolina’s unique landscape legacy, we can achieve a balance between preservation and growth that acknowledges and reaffirms the historic, scenic, and botanic significance of this landmark campus. The gateway to the University, McCorkle Place, exhibits a strong sense of identity as it marks the historical beginnings of campus. Buildings act as a backdrop to the picturesque landscape of mature overstory trees and rolling topography of the quad. However, the lack of a dominant second generation of trees threatens the future character of this space. Views towards adjacent parking areas have become more prominent as foundation and screening plantings have been removed and replaced with varied plant material. 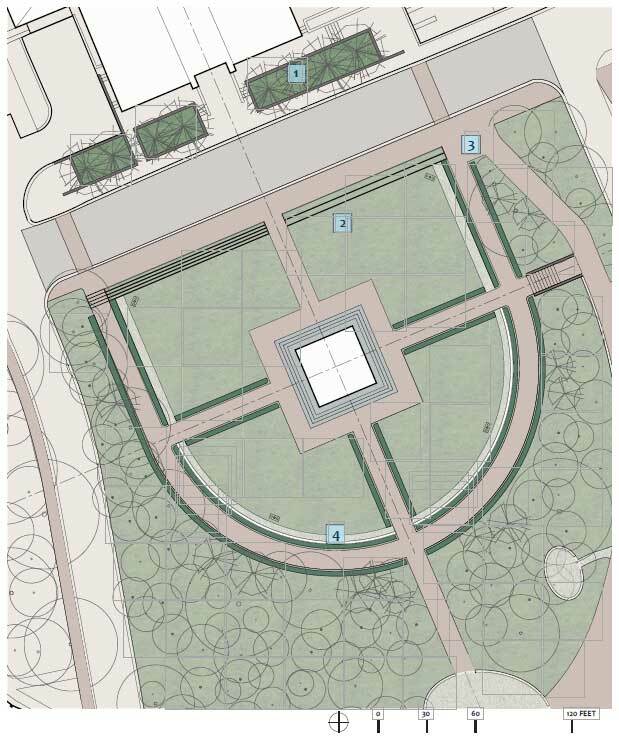 Additionally, an opportunity exists to redesign the plaza surrounding the focal Old Well, creating a uniﬁed design reminiscent of the quads historical picturesque setting. Develop a strategy to maintain & enhance vegetative character: Inventory existing trees, their condition, tree canopy and soils to speculate vegetative growth patterns. Develop a matrix for plant selection and plant next generation of trees. Revitalize & enhance foundation and screening planting design: Assess existing foundation plantings and develop a prototypical layout and matrix of recommended plantings to be used at building foundations and to screen surrounding parking areas. 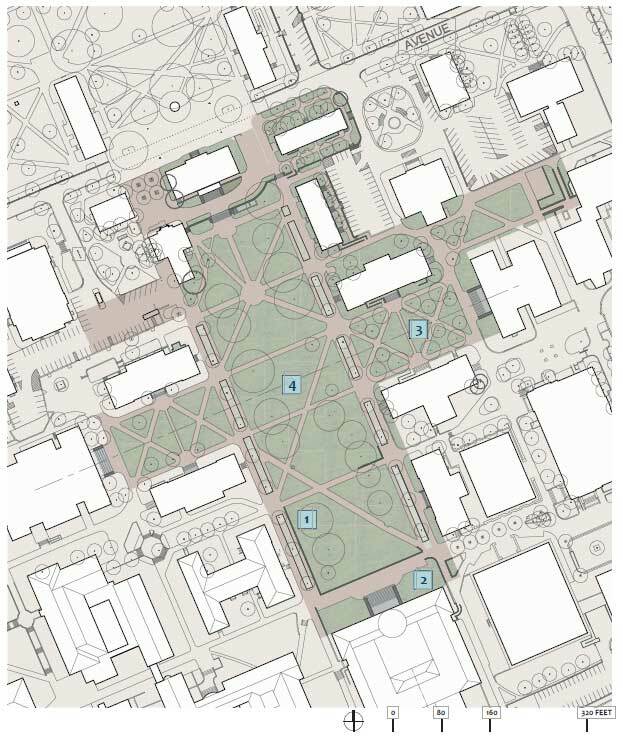 Redesign of Old Well Plaza: Develop a picturesque, unified design for the Old Well Plaza by reconfiguring pathways and planting areas. Remove curbs and raise the grade to street height to create a pedestrian-oriented space. 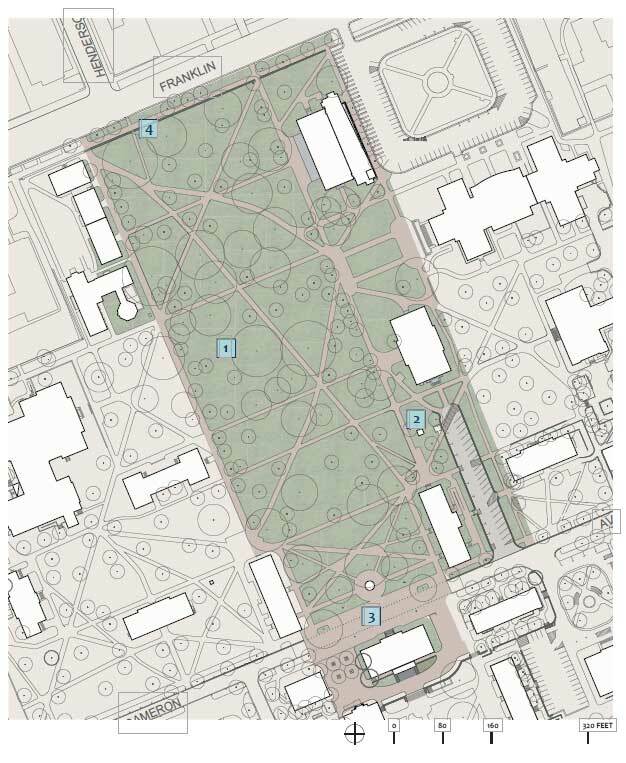 Develop an approach for locating & selecting essential site furnishings & materials: Address the need for site-specific furnishings and materials that reflect the origins and development of McCorkle Place. Develop an approach for locating these essential amenities. Polk Place exhibits a strong sense of identity with its dual lines of mature overstory trees, views over the great lawn, and heavily inﬂ uenced Beaux Arts character. However, ongoing utility and renovation projects have plagued these assets, resulting in highly disturbed soils and stressed trees over much of the quad. Additionally, the location and addition of essential amenities such as bicycle racks and light standards also impact the space, interrupting long views over the great lawn. This visual integrity is also diminished in the side quads, as they are overdesigned and cluttered, further impacting the overall connectivity and relationship to the great lawn. Revitalize & enhance foundation planting design: Assess existing foundation plantings and develop a prototypical layout and matrix of recommended plantings to be used at building foundations. Redesign of secondary quads: Edit and erase features from secondary quads to reunite grassed lawn panels with the larger quad. Reconfigure pathways, planting areas, and associated seating. Develop an approach for locating & selecting essential site furnishings & materials: Address the need for site-specific furnishings and materials that reflect the origins and development of Polk Place. Relocate site amenities (such as bicycle racks) closer to building envelopes. Relocate features such as light fixtures and flagpoles to open up primary long views and enhance the formal axial relationships of Polk Place. The highly visible Morehead-Patterson Bell Tower deﬁnes a campus icon from the 1940s. The semi-circular site, a formal landscape setting slightly isolated behind a veil of an overgrown boxwood hedge, functions more as a pass through space, rather than a destination. The space remains relatively underutilized throughout much of the year, with the exception of football game-days. The existing topography becomes steep to the west, creating accessibility concerns. The height of the existing boxwood hedges is also a liability, as they are overgrown and mask the base of the Bell Tower, enclosing the lawn panels, limiting views and generating safety concerns. Develop a strategy to enhance vegetative character & extend transition woodland: Develop a matrix for future plant selection. Extend edge of Kenan Woods to create a transition woodland area with flowering trees. Extend woodland across South Road by planting a bosque of trees within the existing planting areas south of the Wilson Library. Connect the Bell Tower back to the campus landscape: Improve overall visibility towards the Bell Tower. Remove selected areas of boxwood hedge to open views towards the base of the Bell Tower. Modify the height of the hedge to enhance sight lines and aid in safety. 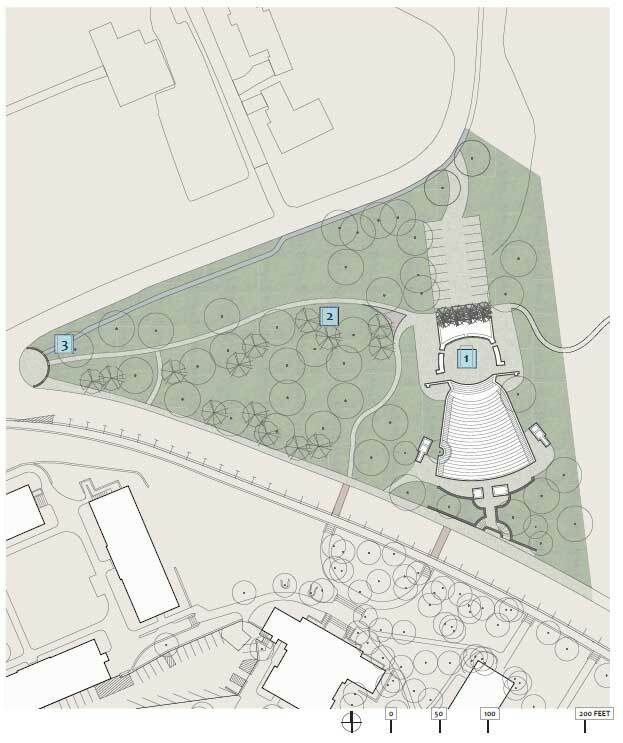 Address grading & accessibility: Widen sidewalk to create a gathering area north of the Bell Tower. Install a limestone wall with turf steps to relieve grade and encourage use of the space. Introduce a diagonal walk that connects the existing crosswalk from the Wilson Library to Stadium Drive. Identify an approach for greater consolidation of future memorials: Install a curved limestone bench that can be engraved by graduating classes or patrons as a memorial. 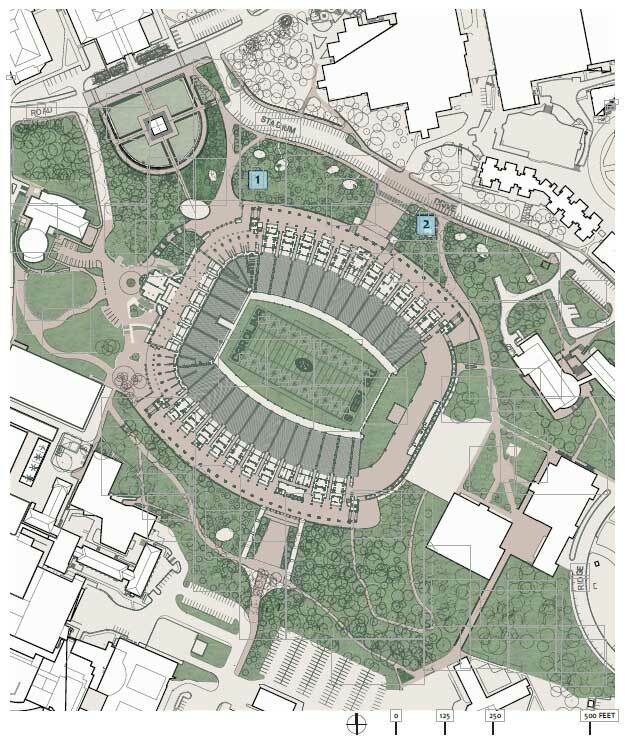 Kenan Stadium and surrounding Kenan Woods lay both physically and socially at the center of campus life. Historically developed as a depressed bowl set within in a natural ravine, the immediate wooded setting has and continues to distinguish this stadium apart from other collegiate sports stadiums. However, the integrity of the woodland is in a state of decline, as many trees on site are overmature and further impacted by poor soil conditions. Game day and non-game day foot traffic also has a significant impact on the development of a prominent vegetative understory, as the pedestrian circulation is primarily uncontrolled. Since seedlings are not currently protected,not currently protected, opportunities for forest regeneration are limited. Therefore, a vegetation management strategy must be developed. Strategy for the reforestation of the declining woodland: Inventory existing trees, their condition, tree canopy and soils to speculate vegetative growth patterns. Develop a matrix for plant selection. Create a reforestation plan using step-by-step “patch” approach to manage the site over time and reconcile existing forest dynamics with site conditions. Install trees in “patches” to ensure growth and protection during seedling establishment. Enhance and control pedestrian circulation: Introduce seating ares and gathering spaces to be used on game and non-game days to help alleviate soil compaction over root systems. Use Chatham stone walls and understory plant material to direct how visitors move through the space on both game days and every day. Nestled into the rolling topography, the Forest Theatre sits almost hidden among a mature collection of beech, maple and oak trees. Informal paths wind through the site, creating short cuts to the nearby Battle Park trailhead, Coker Arboretum and back towards the larger campus. However, this beautiful facility is vastly underutilized due to obsolescent infrastructure, perhaps as a result of the lack of programming. Access into the site is also a concern, as makeshift pathways have resulted in exposed tree root systems, increased erosion and the presence of numerous invasive plant species along the edge of the adjacent slope. Improvements to existing infrastructure: Rehabilitate the existing Theatre and associated out-buildings, bringing infrastructure up to code with improvements to utilities, ADA accessibility and stormwater management. Pursue National Register of Historic Places designation. Explore the creation of an expanded umbrella organization to aid in programming of the Theatre. Strategy to maintain and enhance vegetative character: Inventory existing trees, their condition, tree canopy and soils to speculate vegetative growth patterns. Develop a matrix for plant selection. Remove invasive species and build up slope edge with understory plantings. Replace empty tree pits with new trees and screen view to parking lot with an evergreen grove and native vines. Increase accessibility & enhance connections: Create corner plaza at Battle Lane and Country Club Road. Enhance woodland pathways from plaza and through woods to honor existing desire lines. Create mid-block crossings at formal entry. Explore opportunity to close street for special events and performances.